First impressions I was flying between Beirut and London with LOT, with a connection in Warsaw (for a review of the Beirut-Warsaw leg on an Embraer 170 aircraft click here). The service into Warsaw arrived at 0610, 30 minutes ahead of schedule, and transit passengers were advised to head for the transfer desk to obtain their boarding passes. We were then bussed a short ride to the airport terminal. I was the first in the queue at the transfer desk, and again for the security check, where laptops and liquids were required to be removed. Having passed through the check I looked back to see a large queue forming at the transfer desk. I headed straight to gate A28, and was there well ahead of time at 0640 for my 0750 flight LO281 flight to London Heathrow. 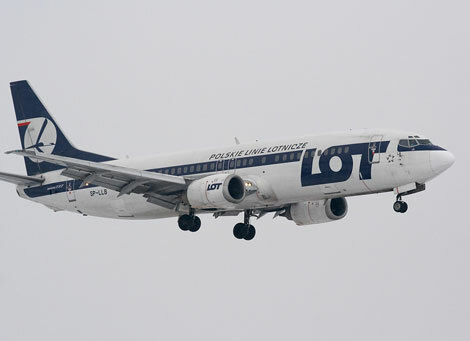 LOT flies three-times daily between Warsaw and London. I noticed that BA’s 0810 service to London was departing from the gate next to ours, and indeed started to board slightly before our flight, which was airbourne by around 0820. The seat I had checked in online for this leg of the flight, and had chosen seat 3C at the front of the economy section, with the aircraft configured 3-3 throughout (except the two rows of business class which had the middle seats kept free). It was certainly not a new aircraft, but the seating was clean and comfortable enough, with a width of 17 inches, pitch of 32 inches, and recline of 30 degrees. For a seatplan of this aircraft, click here. Which seat to choose? I chose a seat near the front of the aircraft to try and get a quick getaway at Heathrow – there’s little to choose from the seats in the economy cabin, which go from rows 3 to 18. The emergency row 8 offers slightly more leg room, and there is a toilet at the back of the aircraft. The flight Economy was almost completely full on this flight, with about half of the business class seats taken. Soon after take-off we were offered a cleansing wipe, and drinks were served. On this two hours 45 minutes flight we were offered a vacuum-packed chicken wrap, and later a crew member came round with a basket of chocolate wafer biscuits. The flight itself was uneventful, and staff were polite throughout. Arrival The flight arrived on time, and with hand luggage only I headed straight to immigration. The IRIS machines were open, but as there was no queue at the desks so I opted for the latter, and was landside within about 20 minutes of touching down. Verdict A comfortable flight, with slightly more leg room that on the Beirut-Warsaw leg (click here to read the review).